NEW YORK (Scrap Register): US total Steel scrap exports were 1.38 million mt in the month of September, total Ferrous scrap exports from the US to Vietnam reached a 12-year high of 177,025 mt in the month of September, the second highest monthly volume on record. The Ferrous scrap exported by US' to Vietnam mostly originated in Los Angeles with 80,442 mt, San Francisco exported 50,387 mt and Columbia-Snake with 33,918 mt in the Pacific Northwest. The first three quarters of 2018, US ferrous scrap exports of 12.98 million mt are the highest since 2013. The top destinations were Turkey with 2.69 million mt, Mexico with 1.47 million mt, Taiwan with 1.42 million mt, Canada with 928,405 mt and India accounted with 771,971 mt. 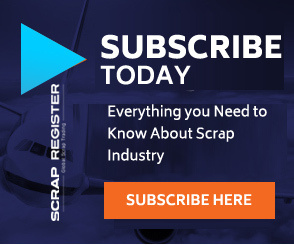 Through September, over two-thirds of the US steel scrap exports were HMS 1 and 2 at 4.64 million mt and shredded scrap at 4.3 million mt while exports of No. 1 and No. 2 bundles totaled 24,187 mt, the lowest on record.